Dia de Muertos or Day of the Dead is a Mexican holiday celebrated to remember your friends and family who have passed on. Now I don’t need a special day to remember my mom or any of my loved ones who have gone on to a better place; but I do like the idea of this day as people celebrate the lives that the dead lived and it’s not about grieving. I have been looking for Mexican chocolate for over a year now, but I wasn’t going to make a trip or purposefully look for a Mexican grocery store in Toronto. I was shopping in the Detox Market and found Mexican Chocolate here of all places and that means I can make my spiked Mexican hot chocolate. 1. In a small saucepan heat up the milk over medium heat. 2. 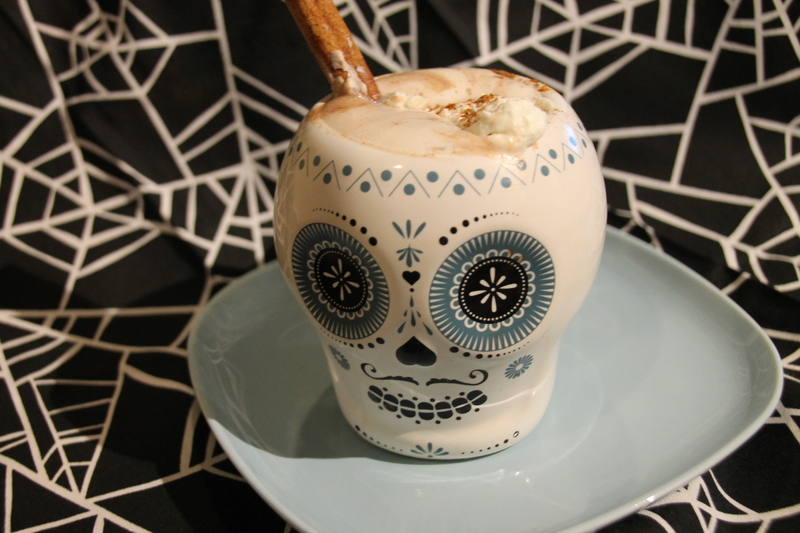 Whisk in the tequila and chocolate pieces and combine until melted and frothy. 3. Using an electric mixer, or by hand whip heavy cream. 4. Top with whipped cream and grate cinnamon, nutmeg, cayenne pepper, chipotle chocolate and put a cinnamon stick in. This had some heat thanks to the chipotle and cayenne on my lips which I enjoyed. On a cold night curled up watching a movie this is a great a different spin on a traditional hot chocolate.